‘Tank rider’ infantry disembark from T-34-85 (armed with the longer 85mm gun) during the battle for Odessa in 1944. Undoubtedly, it was a long way for the T-34 that the Red Army could ultimately win WW2. However, the price was enormous, as about 44,000 T-34 tanks (or 82 per-cent of total production) was a total loss. 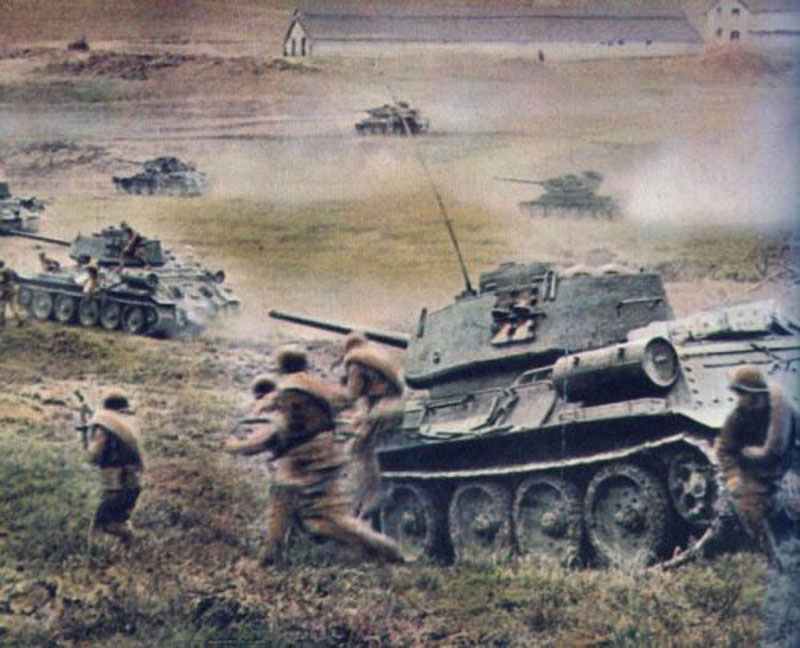 Russian arms production during WW2 amounted to 99,150 armored vehicles (including all kinds of assault guns, tank destroyers and self-propelled guns) from June 1941 to May 1945. There were also delivered 11,900 tanks and self-propelled guns, which are part of Lend-Lease program by the Western Allies. The Germans were often accused of having built too few tanks during the Second World War. Too few high-quality tanks with too many complicated details and too much quality control were produced. In support of this assertion, it is pointed out that German tank production amounted to only 26,900 tanks during WW2. However, tanks formed only a small part of the German AFV production. In fact, from 1938 to May 1945, however, 26,925 tanks; 612 command tanks; 232 flame tanks; 10,550 assault guns; 7,831 tank destroyers and 3,738 assault or self-propelled artillery were built. The total number of armored vehicles is about 49,900, with a total production of 89,254 armored vehicles of all types. This corresponds to about 50% of the total Russian production of armored vehicles during the Second World War. It should be remembered – which is often ignored – that the strategic bombing of the Allies reduced German tank production by about 10 per-cent in 1943 and 40 per-cent in 1944 and even more in 1945; at a time when the output reached its peak. There is no doubt that high-quality design, subtleties of the design and high-quality components of the German tanks had to contribute to a relatively slow production rate. By comparison, the Russian tanks had in general only a simple and crude design and missed many characteristics which were regarded as self-evident by German tank drivers and, to a large extent, by their Western counterparts. There were, of course, much more Russian tanks, which ultimately helped win the war. It was, however, the same refinements and subtleties of the draft, which enabled the German tank crew to gain the advantage on the tactical level of combat. The Russians also had the choice in the production of weapon systems during WW2: they were either able to carry out a mass production of lower quality or a lower production rate at a higher quality. They usually chose the quantity versus quality, but paid an extraordinary high price of human life for it. In the case of armored vehicles, this ‘price’ amounted to 96,500 tanks, compared to 32,800 German AFVs on the Eastern Front during the Second World War. This corresponds to a loss ratio of 2.94 to 1. The German losses also include all self-propelled vehicles, self-propelled artillery and several thousand vehicles, which were just captured when Germany surrendered. Thank you very much for the info. Could you tell me from which book did you get it? Unfortunatly not, please have a look on the Termos of Use in the middle of the Homepage or for the optional recommended Amazon books – if any – on the page of contents.